Cancellations are not accepted 21 days before the arrival day. Cancellation penalty: reservation chargeable. 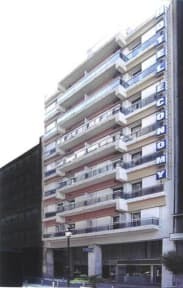 Our Hotel is a 56 room family Hotel located in the centre of Athens on a quiet road, next to the Old Town Hall of the city on Athinas Street. 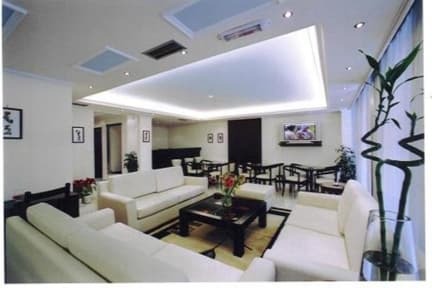 The location of the hotel allows easy walking access to the main tourist attractions of Atthens, the business and commercial zone of the city or the shopping and entertaiment centre of Plaka area which is just 5 to10 minutes away on foot. The Acropolis entrance on the top of the hill is 14 to 18 minutes away, the National Archaeological Museum and the University are 5 minutes away and Syntagma square is just 10 minutes from the hotel. Nearest metro station from the airport is: Monastiraki station. Each room has a private bath with hot water 24 hours a day, a TV, soundproof windows, direct dial telephone, hair dryer, small balcony, refrigerator, safe box, WiFi and all rooms are air-conditioned. Breakfast is included at the prices. During summer you can enjoy your drink (self service)at the roof garden with a view of the Acropolis and Lycavitous Hill. You can use the metro lines to :Airport (45 minutes trip), port (25 minutes trip) and train station (5 minutes trip). Athens city sightseeing bus stop: City Hall is only 50 meters away from the Hotel entrance. We loved this place! Clean room, helpful, friendly staff, great breakfast too. Wifi worked great but best of all.. the location was close to everything we wanted to see. Great value for money. Staff was very helpful! We had a good stay at the Economy hotel. It was well located for our needs. The staff were helpful. We arrived late and only spent a few hours here before sailing from Athens, but the room was nice, the air con was great. Beds comfortable. Was a nice but brief stay! Helpful and very nice staff. The location is great; you can reach the metro station to go everywhere by walking 5 minutes. Really clean and the breakfast is definitely a plus. I would definitely stayed there again. Two staff members we dealt with were lovely. Held our luggage after we checked out on our last day so we could still sight-see before our flight. Close enough to all major monuments etc and very close to local markets. Room simple but had everything we needed. Lift was very small and quite hot but this was the only negative. Obviously being a hotel not a hostel there is no communal area or atmosphere but we did not mind. The staff was amazing: welcoming and incredibly helpful. The hotel room was nice and clean, wifi worked perfectly and breakfast was great. The only negative point is the location. The neighborhood doesn't feel very safe at night. It is a very popular neighborhood with a lot of homeless people, the streets are not very clean and well lit at night. Very clean hotel with friendly staff. Location is good for all Athens attractions but it’s off some fairly dodgy streets.